A team of researchers from ETH Zurich and the University of Basel in Switzerland and Institut Universitaire de Technologie in France has that found that embryonic kidney cells engineered to produce insulin when exposed to caffeine were able to reduce glucose levels in mouse models. In their paper published in the journal Nature, the group describes their efforts and how well it worked in the mouse models. People with diabetes suffer from higher than normal levels of glucose in the blood, which can lead to a host of health problems. Current treatments include drugs that make cells more sensitive to insulin, or injection of insulin to make more of it available to cells that need it. 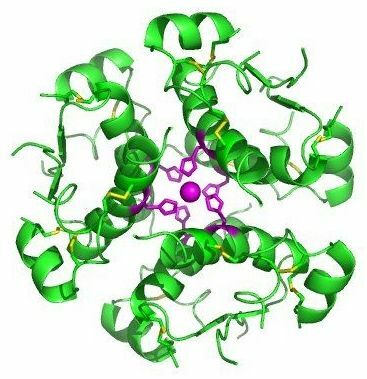 In this new effort, the researchers have developed a new way to get more insulin into the body when it is needed most. Instead of adding insulin externally, the researchers engineered embryonic kidney cells to produce it—but only when they were exposed to caffeine. The team chose caffeine because it has been so extensively studied and because the majority of people consume caffeinated beverages, such as coffee and soft drinks. They point out that caffeine is also a substance that appears very rarely in other foods, making its ingestion easy to regulate. The engineered cells were covered with a material that protected them from the immune system and were then put into a device that was implanted into the abdomens of mice that had been engineered to have diabetes. The researchers note that glucose levels tend to spike after people (and mice) eat sugar or food material that the body converts to sucrose. Thus, the optimal time for giving the mice caffeine would be after eating.